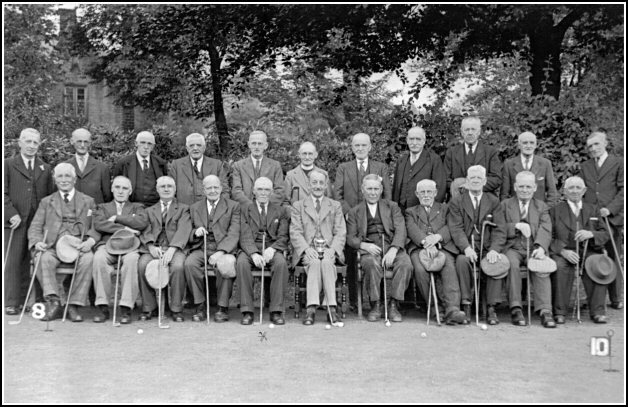 "The picture of Sutton Putting Club would be from about 1945-1947, and the gentleman with an X in front of him is my maternal grandfather, George Tingle, who emigrated with me and my family to Canada in October 1947." Duncan McHenry identified his grandfather, park keeper Charlie Pritchard, sitting on the left of the gentleman holding the cup. I think that the thin faced man, second from the left on the back row might be Robert [Bob] Lowcock from Hazel Grove. He used to spend a lot of time on the putting green. The minister is The Rev. Bloyce Smith? who was at th Baptist Chapel before Mr. Buck. He was the poor chap that went up on the Gibb and took his own life. The second from the left on the back row is almost certainly Uncle Bob Lowcock. The tall gentleman three in from the right on the back row looks like Mr. Edward Harrington, Mill Manager. Always wore a trilby.